Experience the thrill of owning a state-of-the-art home theater at an affordable price. Never before has the concept of a home theater for your home been so real and achievable. Whether you are adding a new home theater or renovating an existing one, we can design a solution to fit your needs. A McKinney home theater is more than just state of the art video and a hi-fi sound system. Your room should be as unique as you are! Maybe you want to watch your favorite sci-fi in a Theater Under the Stars. Whatever your inspiration is, we will build the perfect room to enjoy your favorite movies and shows with your family and friends. Hi-fi surround systems by Integra, Marantz and Sony, along with speakers by Triad, Speakercraft, Sonance and JL Audio to give you the most realistic sound possible. You will feel like you are in the middle of the action with your favorite actors! 4K ultra high definition projector and screen by Epson, Sony, Digital Projection and Screen Innovations. This new technology far exceeds 1080p, giving you a vivid, life-like picture. In addition, Laser projectors mean no replacing lamps ever again. Interior designs and furnishings to optimize your experience and make your dream home theater a reality. From acoustic panels to tiered theater seating, we will create the ultimate entertainment experience. Control systems by Elan, Savant and Control4 that are easy to use and integrated with the rest of the technology in your home. 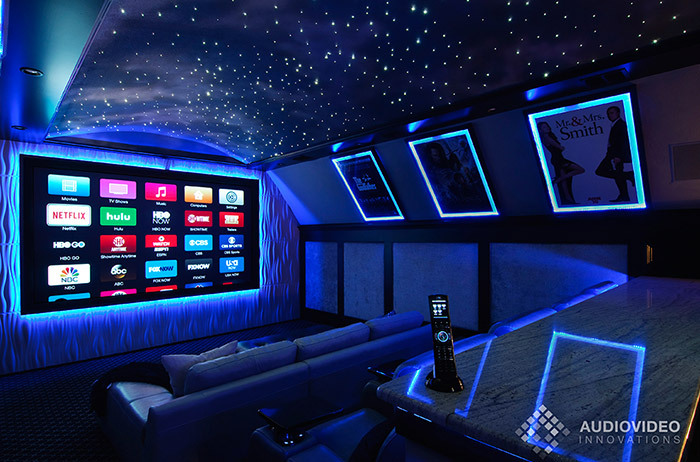 We have designed a variety of different theater packages for almost every budget so even the entertainment enthusiasts can experience the thrill of a cutting-edge theater system in their Dallas area home.